One of my strategies toÂ eating around New York on an indispensible budgetÂ is to do lunch well – especially if the dinner entrees of a desired restaurantÂ tend to hit a higher price point. Lincoln, however, was not to fall under that game plan. Sam Kim said, “It’s THE opening of Fall .” So I secured a reservation three weeks prior to opening and four before I boarded for JFK. 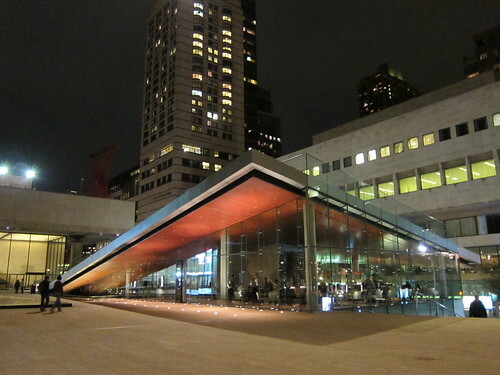 It is a special place that, upon approach and even closer look, was designed to seamlessly blend into Lincoln Center. It is successful, indeed – etymologically and aesthetically, inside and out. It’s a masterpieceÂ complete with a sloped,Â grass-coveredÂ roof that doubles as a lawn. I had two dinner companions, and we all agreed that the feel of the space was uniquely pleasant. Beautiful.Â “It’s like how an airport is supposed to feel,” my friend Robbie said. The pristine, glass-encased kitchen highlighted the excellent service we received all night in an impeccably casual, yet elegant,Â ambiance. Through theÂ glass walls,Â I admired Jonathan Benno – previously Chef de CuisineÂ at Per Se forÂ 6 years – as he sent out each dish. The servers’ pace was expedient but never hurried. We were artfully presented with thin crisps – seasoned with things delightful and elusive to my memory – before a perfect selection of three varieties of bread. The butter, made with 83% Vermont buttercream, was some of the best I have ever had. 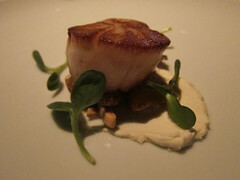 Our appetizer, a perfectly seared sea scallop with almonds and sunchoke smear, was a delicious departure and made me excited for more. We were all in the mood for the Primi (pasta) selection on the menu, though I’d be lying if I said the Carne didn’t pique my curiosity. The Bistecca alla Fiorentina ($90)Â yields 28-day aged prime black angus sirloin, bone marrow sformato and cipollini agro dolce. Sure, I was committed to dinner but also next month’s 31-dayÂ rent. Perhaps on a return New York rendezvous. 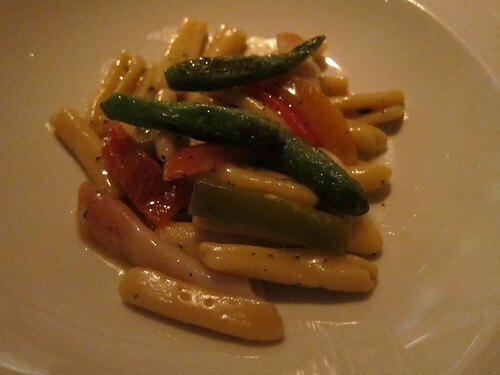 I had to witness the pairing of cavatelli with razor clams by ordering it. True to suspicion, they blended perfectly and in no small part by the lemon thyme sauce. I enjoyed discovering whether each morsel was a clam or cavatelli. 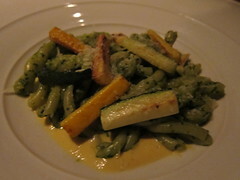 Dave, a pescatarian, ordered the Pesto Strozzapreti with Zucchini.Â The rustic pasta shapesÂ were inÂ a classic, well-executed pesto sauce and accompanied by fresh, perfectly-cooked vegetables. Robbie very much enjoyed his piping hot Lasagne Verdi alla Bolognese, the ragu sauce ofÂ which included pork, veal and beef – and I enjoyed my little bite of it. 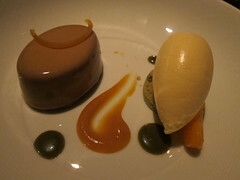 Dessert was a symphony of flavors – a perfect fall finale of pistachios with pistachio cake andÂ burnt orange sauce set against a vibrant orange sorbetto with the chocolate budino ultimately being the deliciously rich centerpiece. As it was drizzling outside on this New YorkÂ September night, it was nice to cap off the evening with an espresso and this really elegant dessert. My modern Italian meal at Lincoln (along with Del Posto – post to come, later) embodied what I rarely experience and missÂ in Los Angeles. It’s meals like this that remind meÂ that my experience with service professionals in L.A. dining establishments by and large are means to the “big acting break”Â end. Service at Lincoln, however, is impeccable, extremely courteous and prompt. The cuisine is meticulous and the furnishings and overall feel are unmatched. Expect many accompaniments before and after your meal (pastries came after dessert, too) and back-of-the-hand menu knowledge by each member of the staff. I will return here when I return to New York (especially after learning upon further research they have a Negroni bar!). 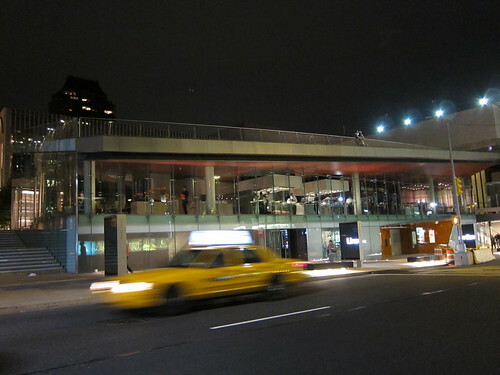 This entry was posted in cocktails, Food, New York, wine and tagged Dinner, Fall 2010, Food, Italian, Jonathan Benno, Lincoln, Lincoln Center, Lincoln Ristorante, Lincoln Square, Midtown, Modern Italian, new york, opening, Patina Group, restaurant. Bookmark the permalink.